Hard to believe, after several years of doing this blog, that I find yet another Pueblo record I never knew existed. Outstanding, homey country, with folk overtones, and lots of harmonica. This needs to see the light of day, and it needs to be heard. 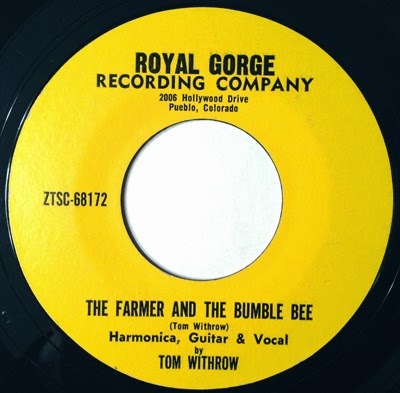 Listen to a sample of "The Farmer and the Bumble Bee"
My dear friend, and Pueblo-based record dealer, Joel Scherzer tells me that several years ago a friend of his found a copy of this record, and went to the address listed on the single, to get more information. The friend apparently talked to Mr. Withrow back then, who told him the recording was possibly made in the late 1950s. "Loyd Thomas 'Tom' Withrow, born Nov. 8, 1920, in Miller, Mo., passed away Oct. 9, 2001. Loyd was the son of John Thomas "Tom" Withrow and Martha Matilda (McVey) Withrow. He was a communications specialist for three years during WWII where he proudly served his country in the Philippines with honors. Tom worked as a telephone lineman upon his discharge from the service. He later became an electrician and worked in this occupation for 45 years at the time of his retirement. He was a member of Local Union No. 12 of the IBEW and would have had 60 years of membership in January. He was very proud to have worked in his chosen profession."